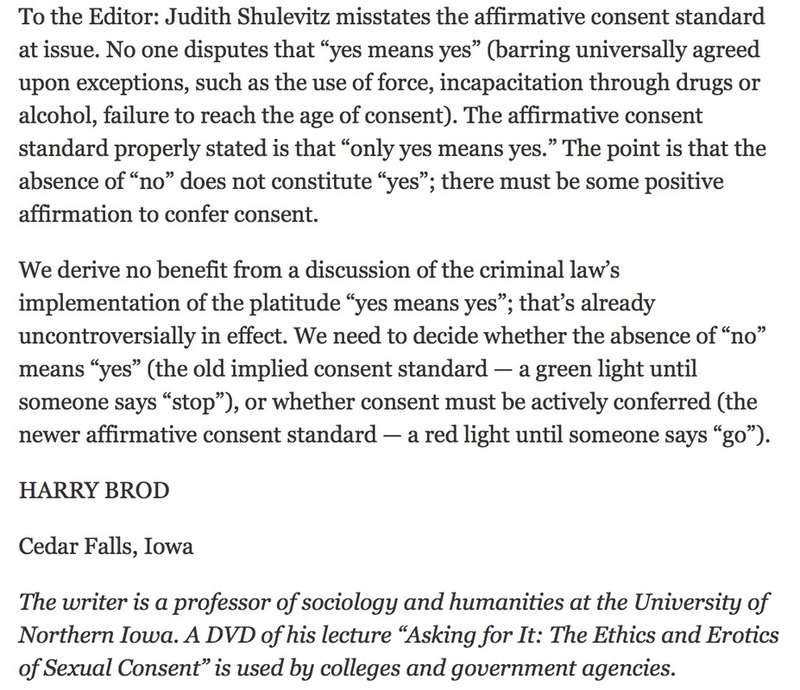 (ABOVE) Consent Stories Advisory Board Member and Men's Studies Scholar Harry Brod, who passed away in June, 2017, took on Judith Shulevitz' June 28, 2015 Op-Ed in the New York Times regarding Affirmative Consent. Dr. Brod, a Philosopher, developed the Affirmative Consent paradigm. ​We have received questions about our stance on Affirmative Consent. We support the Affirmative Consent standard. In fact, the scholar who devised it, Dr. Harry Brod, is one of our Advisory Panel members for this reason. Our critique is not of the Affirmative Consent framework itself. Rather, we argue that achieving the ideal of clear and affirmative consent requires shifts in social norms and increasing individual confidence and communication skills. The difficulty of achieving this ideal is linked to issues of shame and guilt that are socialized into people through our early learning around sexuality, and the many constraints (taboo, stigma, heteronormativity, body-shaming, binary gender scripts, racism, among others) that undermine self-esteem and authenticity in relationships. As scholar-practitioners, we are focused on understanding how people currently express their sexual interests and aversions in intimate settings, and utilizing that data to create educational and psycho-social tools and materials to make such skills more accessible and enhance support to enact them. Affirmative Consent is an ideal, and we are committed to helping that to be a more common occurrence.